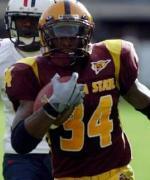 ASU RB Loren Wade could be one of the PAC 10's biggest surprises. Only a few days remain before the start of the 2004 college football season, but you'd never know it by the way the defending Pac-10 champion Trojans have been preparing to defend their crown. With fall camps beginning all around the country, the Pac-10 has something to prove this year. After conference champion USC finished #1 in the AP poll last year and split the national championship with SEC champion, LSU, debates arose about the strength of the Pac-10 and that it may have been what limited the Trojans from appearing in the BCS title game. With USC as a favorite to repeat this year, many teams have the opportunity to surprise the rest of the conference or perhaps the nation with a strong effort. California is the odds on favorite to challenge USC for the crown and should finish in the top third of the conference with ease. Oregon doesn't have the Trojans on their schedule this year and could finish well despite having to make visits to Cal and Oklahoma. The team that will make the biggest splash in the conference race this year is going to be Arizona State. Not enough credit is being thrown the way of the Sundevils after a disappointing finish in 2003, but with the leadership of senior QB Andrew Walter and the emergence of sophomore RB Loren Wade, this is the team that has the offensive tools to come up with a big turn around from one year ago. #1 USC Trojans - (8-0, 12-0) Boasting what many prognosticators deem the nation's #1 recruiting class and the return of last years dominating defense, the Trojans are an easy pick to come out of the Pac-10 unscathed. The men of Troy begin the season on August 28th in the BCA classic and face an offensively depleted Virginia Tech team. Perhaps the toughest matchup on the schedule for the Trojans is Halloween weekend when they will travel to Pullman and face WSU. With superior coaching, a well-oiled offense, and great experience defending their own end zone, the Trojans are primed for a run at consecutive Pac-10 titles. #2 California Golden Bears - (6-2, 8-3) The Bears must travel to Southern Mississippi, Oregon State, and then to USC three games in a row right near the beginning of the season. Five of the Bears' first seven games will be on the road. The USC matchup will be a greatly hyped up rematch of last years upset. Cal will play the Trojans tough at their own home and may come away with a victory if all goes their way. If the Bears can come away from the early road trip with a couple of wins, they will build up enough momentum to carry them through the end of the season. Aside from JJ Arrington, the running back corps seems a little green, but having lead the Pac-10 in rushing last year, this team isn't worried about having lost Echemandu one bit. Returning all but 7 starters also isn't so shabby. #3 Oregon Ducks - (6-2, 8-3) With perhaps the most overlooked quarterback in the conference in Kellen Clemens, the Ducks will make some noise in the Pac-10 this year as they attempt to bounce back from an up and down showing last season. Because a scheduling quirk has the Ducks and Trojans missing each other two years in a row, Oregon will get a chance to face the rest of the teams after a tough out of conference September that includes a trip to play title contender Oklahoma. Look for junior RB Terrence Whitehead to make a solid contribution from the backfield this year as the Ducks balance out their scoring attack and put up some big offensive numbers. #4 Arizona State Sundevils - (5-3, 7-4) It won't be easy, but ASU will try to make amends for the disappointment they were a year ago, winning only two conference games. Andrew Walter will have the much needed help of sophomore RB sensation Loren Wade in the backfield. Hopefully, the offensive line can hold up long enough to give Walter time to get the ball into the hands of junior WR Derek Hagan, who reeled in catches for 9 TD's last season. This team has a tough schedule, having to meet USC, Cal and Oregon away from the comfort of Sundevil stadium, but the rest of the conference schedule should be to coach Koetter's liking with the season kicking off with UTEP at home on September 2nd. #5 Washington State Cougars - (4-4, 7-4) Bill Doba will have his hands full this season even with a pretty tame schedule, as he returns only six players, four on offense (three of them OL and one TE). On defense though, junior LB Will Derting will be the centerpiece to a massive rebuilding project. Junior TE Troy Bienemann is as solid as they come and should provide a nice big target for sophomore QB Josh Swogger. As if All-American candidate Troy Bienemann wasn't enough for opposing defenses to handle, sophomore TE Cody Boyd returns at six foot eight inches having made 18 catches last year. Even with the rough road ahead, because of Doba's ability to take what he inherited a year ago and turn a 10-3 record, including beating Texas in the Holiday Bowl, the Cougars will be a fairly decent team. #6 Oregon State Beavers - (4-4, 6-5) The Beavers have a solid returning defense but more impressively, have something quite rare in the conference, a senior QB. Aside from ASU's Walter, Derek Anderson is the only senior signal caller in the Pac. He will most likely direct most of his passes to junior WR Mike Hass who led the conference in yards per reception last fall at 23 YPR. Even with the top three teams coming to Corvallis, the Beavers will have a tough time breaking out of the 5th place tie they ended up in at the end of last year. Oregon State is also the only team in the country with the dubious distinction of having to play both of the past years' national champions. #7 UCLA Bruins - (3-5, 4-7) Despite the abundance of returning offensive starters and perhaps the Pac-10's best linebacker in Spencer Havner, the Bruins will have a hard time putting it all together. Karl Dorrell just does not have what it takes to compete against the higher echelon of coaching in the conference. With a full year under his belt, some changes will most definitely be apparent but on the same hand will most definitely not be enough to compete in this conference. Look for UCLA to get off to a slow start with a visit from Oklahoma State and then a two game road trip. Good or bad, the Bruins play only two games in November and have three weeks to rest up for traditional rival, USC on December 4th. #8 Washington Huskies - (2-6, 4-7) The Huskies were a somewhat unpredictable team last year with all the drama surrounding the program before the season began. Their tie for fifth place in the conference might have come as a surprise to some, but the level of talent at UW has recently been declining. It will be hard for coach Gilbertson to bring this program back to prominence this year with the talent he has to work with. The Huskies' offense last year consisted basically of Cody Pickett and Reggie Williams, whom have each since departed for the NFL, so finding production will not be easy and may only get harder as the season progresses. #9 Arizona Wildcats - (2-6, 3-8) Mike Stoops and his brand new coaching staff will be put to the test right away with early games against Utah, Wisconsin, and WSU. Luckily, the Wildcats' first four games will be played in Tucson. In fact, Arizona only plays four games total away from the comfort of home. Unfortunately, those games are at UCLA, USC, Oregon and Washington. Also of note is that the Wildcats will be the only team unable to take a shot at the Stanford Cardinal this year, which might have been a nice scrimmage for the young coach. The good news is that Stoops gets to work with plenty of returning starters and will have his name to recruit with for the years to come. #10 Stanford Cardinal - (0-8, 2-9) The Cardinal return almost all of their defensive starters this year. Unfortunately, last year, these very starters gave up nearly 435 yards per game, finished last in the Pac-10 in pass defense, and gave up 4.0 yards per rush (only one team did worse). On the other side of the ball, sophomore QB Trent Edwards will be hooking up with sophomore WR Mark Bradford quite a bit but perhaps not enough against these Pac-10 defenses. Don't expect the Cardinal to win more than a single game in conference next year and put your money on Teevens getting the worst of it. Best Team: USC Trojans - Hands down, the coaching, talent, and circumstances all point to the Trojans as conference champions once again. Best Coach: Pete Carroll - His energetic style and defensive mind have infected those around him, and the players and coaches are believing there's nothing they can't do. Best Player: Troy Bienemann, Washington State - A sure lock for a place on the All-American team. Best Stadium: Autzen Stadium @ Eugene Oregon - The intimacy of the home crowd there works wonders for the Ducks and nightmares for unsuspecting visitors. Best Fans: Oregon Duck fans - As little as the nation knows about Oregon, let it be told that the fans there make great use of their stadium, and it gets unbelievably loud. There's possibly no Pac-10 fan more faithful than a Duck fan either. Best Tradition: USC Trojans - 10 National Championships, 5 Heisman Trophy winners, and the list goes on. Best Bet to Under-Achieve: Arizona State Sundevils - They did it once last year, and could very well do it again this year. Best Bet to Over-Achieve: Stanford Cardinal - It just might be harder to lose all your games than it is to win just one. The Pac-10 in 2004 isn't much different than it was in 2003. There will be one dominant team and then a small group of pretty good teams followed by a cluster of mediocre teams and as always, a couple terrible teams. Some say the Pac-10 teams beat each other up so bad, the conference ends up looking weak in the end, and that may be the case this year as well. With great out of conference foes and a potential national championship contending team, even with mediocrity creeping around the middle of the conference, the race should be interesting as it unfolds through the fall. Stay tuned.